They may prove to be right, but as clients had increasingly been asking for help ‘walking the talk’ of being customer centred, I seemed to have been writing parts of the book anyway. As my clients sought ways to include customer insights in the way they worked – to inform and inspire the way they decide on, design and communicate products and services – I’d been writing ‘one-pager’ manuals to prime them for the experience of fieldwork; the mindset, tools and approaches needed to become useful partners in the field. Initially with me, then without. Before long I had most of a practical manual covering the key aspects of design research projects. …And a lot of gaps. Now, a couple of years later, USERPALOOZA fills these gaps. If, as the popular maxim goes, you’d like to ‘put the customer at the centre of what you do’, the first thing you need to do is the opposite – putting yourself into their world. 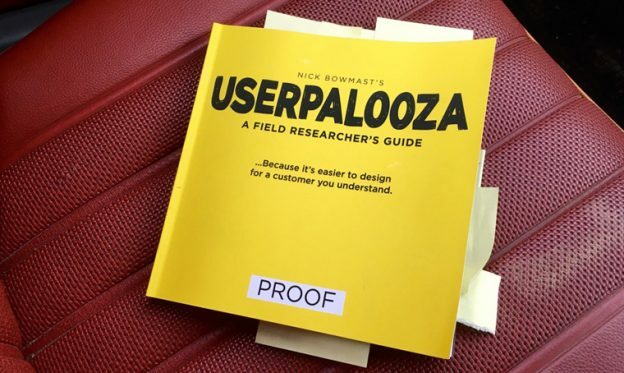 Find out more about USERPALOOZA – A Field Researcher’s Guide, and sign up to be notified when it’s shipping. (Which is a frightening – if not locked – date in the next few weeks).